East New York is a residential neighborhood in the eastern section of the borough of Brooklyn in New York City, United States. Its boundaries, starting from the north and moving clockwise are: Cypress Hills Cemetery to the north, the Borough of Queens to the east, Jamaica Bay to the south, and the Bay Ridge Branch railway tracks next to Van Sinderen Avenue to the west. Linden Boulevard and Atlantic Avenue are the primary thoroughfares through East New York. East New York was founded as the Town of New Lots in the 1650s. It was annexed as the 26th Ward of the rapidly growing City of Brooklyn in 1886, and became part of New York City in 1898. 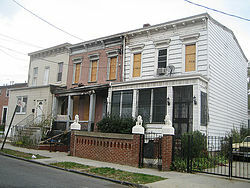 During the latter part of the twentieth century, East New York came to be predominantly inhabited by African Americans and Latinos. East New York is part of Brooklyn Community District 5, and its primary ZIP Codes are 11207, 11208, and 11239. It is patrolled by the 75th Precinct of the New York City Police Department. New York City Housing Authority (NYCHA) property in the area is patrolled by P.S.A. 2. Politically it is represented by the New York City Council's 37th and 42nd Districts. At the northern edge of what is now East New York, a chain of hills, geologically a terminal moraine, separates northwestern Long Island from Jamaica and the Hempstead Plains, the main part of Long Island's fertile outwash plain. The southern portions of the neighborhood, meanwhile, consisted of salt marshes and several creeks, which drained into Jamaica Bay. These areas were originally settled by the Jameco Native Americans, and later used by the Canarsee and Rockaway tribes as fishing grounds. In the 1650s, Dutch colonists began settling in the eastern sections of Brooklyn, forming the towns of Flatbush, Bushwick, and New Lots (the predecessor to East New York). The area along with the rest of Brooklyn and modern New York City was ceded to the British Empire in 1664. A few 18th Century roads, including the ferry road or Palmer Turnpike from Brooklyn to Jamaica, passed through the chain of hills; hence the area was called "Jamaica Pass". During the American Revolutionary War invading British and Hessian (German) soldiers ended an all-night forced march at this pass in August 1776 to surprise and flank General George Washington and the Continental Army, to win the Battle of Long Island, (also known as the Battle of Brooklyn or the Battle of Brooklyn Heights). In 1835, Connecticut merchant John Pitkin (namesake of Pitkin Avenue) purchased the land of the Town of New Lots north of New Lots Avenue, opening a shoe factory at what is now Williams Street and Pitkin Avenue. Pitkin named the area "East New York" to signify it as the eastern end of New York City. In 1836 the Brooklyn and Jamaica Railroad (soon to become part of the Long Island Rail Road) opened through the area; it did not originally stop in East New York, but a stop there was added by 1844. In 1860 the LIRR moved its terminus to Queens, and the line through Brooklyn was shortened to end at East New York. In 1852, New Lots was officially ceded from the Town of Flatbush. In the middle 19th century, the road between Brooklyn and Jamaica became the Brooklyn and Jamaica Plank Road. The Brooklyn and Rockaway Beach Railroad (1865) was built to connect the LIRR's Atlantic Branch with Canarsie at a point later known as Broadway Junction. As often happened at 19th Century railroad junctions, a railway town arose. Sprawling development into recently rustic northern part of the Town of "New Lots" followed the reach of elevated transit lines into the area: the Jamaica Avenue Line in 1885 and the Fulton Street Line in 1889. The road to Brooklyn was renamed Fulton Street, the one to Jamaica, Jamaica Avenue and the one to Williamsburg, Broadway. East New York (as the Town of New Lots) was annexed as the 26th Ward of the rapidly growing City of Brooklyn in 1886; in 1898 after a decade-long controversy with debates, campaigns and publicity, the community was merged into New York City as a whole with the consolidation of Brooklyn and the other four boroughs into a single entity as the "City of Greater New York". In the 20th century its name came to be applied to much of the former township. After World War II, thousands of manufacturing jobs left New York City thereby increasing the importance of the remaining jobs to those with limited education and job skills. During this same period, large numbers of Puerto Ricans from the Caribbean island and African-Americans from the South emigrated to New York City looking for employment. East New York, no longer replete with the jobs the new residents had come for, was thereby faced with a host of new socioeconomic problems, including widespread unemployment and crime. Since the late 1950s East New York has had some of the highest crime rates in Brooklyn, and is considered by some to be the borough's murder capital, alongside Brownsville. Many social problems associated with poverty from crime to drug addiction have been prevalent in the area for decades. Despite the decline of crime compared to their peaks during the crack and heroin epidemics, violent crime continues to be widespread in the community. East New York's 75th Police Precinct reported the highest murder rate in the city in 2011, according to crime reports compiled by DNAinfo.com. East New York has significantly higher dropout rates and incidences of violence in its schools. Students must pass through metal detectors and swipe ID cards to enter the buildings. Other problems in local schools include low test scores and high truancy rates. Walter Thabit, a city planner for East New York, chronicled in his 2003 book, How East New York Became a Ghetto, the change in population from mostly working class Italians and Jewish residents to residents of Puerto Rican and African American descent. Thabit argues that landlords and real estate agents played a significant role in the downturn of the area. Puerto Ricans were moving in masses to New York City in the late 1950s, at a time when unemployment rates in Puerto Rico soared to 25 percent, and left Puerto Rico on the brink of poverty. Thabit also describes how the construction of public housing projects in East New York further contributed to its decline, noting that many of the developments were built by corrupt managers and contractors. He argues that the city government largely ignored the community when it could have helped turn it around. Writing in the New York Press, Michael Manville accused Thabit of poor research, sweeping generalizations, and a failure to distinguish the actions of racist individuals from the effects of a racist capitalist system, and contends that much of the urban renewal and public housing efforts of the period were in fact well-intentioned, if ill-considered and hubristic. East New York was devastated by "blockbusting" in the course of an FHA Mortgage scandal that left the neighborhood virtually abandoned by the late '70s. A Federal Court ordered that an Environmental Impact Statement (EIS) be prepared for East New York. The history of the FHA Mortgage Scandal and its unfolding in East New York was documented via that EIS, which was developed by the Brooklyn Office of the New York City Department of City Planning. The EIS found that what happened in East New York and inner city communities across America was a result of the FHA's inability to respond to its new mandate to include inner city neighborhoods in the FHA single family mortgage insurance program. The FHA was created to build the suburbs of America and all of its policies, underwriting standards, appraisal standards were built from and geared to newly constructed suburban homes. The agency apparently interpreted its mandate to now produce specific target volumes of inner city loans as a directive to abandon its underwriting and appraisal and produce as many inner city loans as possible to mostly Black first-time homeowners. Block by block unscrupulous mortgage originators scared the homeowners in these one and multi-family homes into selling below market for fear their homes would be worth nothing at all as the blacks moved in. These same blockbusting brokers then resold these homes at greatly inflated prices to first-time black homeowners who believed their American dream had come true. The brokers provided fraudulent documentation on the loans which were all beyond the ability of the new homeowners to pay given their modest incomes. The neighborhood went from mostly white Jewish and Italian homeowners to overwhelmingly Black & Latino. Soon afterward some of the new homeowners were behind on mortgage payments and losing their homes to foreclosure. When the Brooklyn Office of City Planning began its court-mandated EIS East New York was a wasteland, row after row of vacant homes in poor condition and a central 4 or 6 block area of vacant land where houses had once stood. The court directive to prepare the EIS on East New York required recommendations as well as findings. The recommendations were then expanded into a Master Plan For East New York which included the entire Community Planning Board. Simultaneously the Brooklyn office developed a more specific plan for the rehabilitation and resale of the FHA foreclosure to qualified low income buyers. The plan was to rehabilitate these homes through non-profit community sponsors and resell them at affordable prices to pre-qualified low income homeowners. The program was called SHIP (Small Home Improvement Program). A $1 million loan pool commitment was secured from the East New York Savings Bank for the SHIP program. The program was then turned over to the City's Housing agency for implementation and administration. The SHIP program was modeled on a program developed the Sunset Park Redevelopment Committee then operating in Sunset Park with funding from the Ford Foundation. The Ford Foundation was also funding other pioneering innovative housing programs, including in nearby Bedford-Stuyvesant through the Bedford Stuyvesant Restoration Corporation. SHIP was the first effort at low income home ownership by the City of New York and ran into some initial difficulties due to limitations in the State constitution on "gifts and loans" (the discounted sales price to new homeowners was considered "a gift"). At least the first 100 houses were eventually renovated under the program before it was abandoned. Later, most of these 1000 FHA foreclosed were torn down and replaced with new construction and much later some privately financed infill housing. Also, many subsidized multi-unit townhouses and newly constructed apartment buildings have been or are being built on vacant lots across the neighborhood. A significant number of these properties, many multi-family buildings, have fallen into disrepair and are at risk of landlord abandonment. In the 1980s East Brooklyn Congregations (EBC), an affiliate of the Industrial Areas Foundation (IAF) organized to address the need for quality affordable housing in East New York. This coalition advocated that vacant New York City owned land be provided at no cost for the development of new affordable owner occupied housing with subsidies for low-interest mortgages. This effort was called the Nehemiah Program. It was replicated in other parts of the city and country and led to national legislation. The Nehemiah homes were funded by a loan from $8 million loan fund from three Brooklyn Churches. Its setup was described as follows by The New York Times the city provides vacant sites, forgives real-estate taxes on the homes (but not the land) for 10 years, and provides what amounts to a $10,000 interest-free loan per house. Buyers pay $43,500 (their median income was $27,000; 40 percent moved from public or subsidized housing)." New developments are rising in the area, including the Gateway Center shopping mall located on what was once part of a landfill near Jamaica Bay. Gateway Center, in Starrett City, is suburban-style, and is home to retailers that include ShopRite, Bed Bath & Beyond, Staples, Marshalls, Olive Garden, Red Lobster, Outback Steakhouse, Target, The Home Depot, and BJ's Wholesale Club. Gateway Center consists of two structures: Gateway Center South, the first structure, opened in 2002, and Gateway Center North, the second development, opened in 2014. Based on data from the 2010 United States Census, the population of East New York was 91,958, an increase of 8,683 (10.4%) from the 83,275 counted in 2000. Covering an area of 2,665.73 acres (1,078.78 ha), the neighborhood had a population density of 34.5 inhabitants per acre (22,100/sq mi; 8,500/km2). The racial makeup of the neighborhood was 63.6% (58,453) African American, 3.0% (2,764) Asian, 1.3% (1,240) White, 0.3% (291) Native American, 0.0% (38) Pacific Islander, 0.7% (683) from other races, and 1.3% (1,237) from two or more races. Hispanic or Latino of any race were 29.6% (27,252) of the population. During the 1960s, East New York transitioned from being predominately Jewish and Italian to being predominately African American and Puerto Rican. However, now East New York is more diversified, with large African American, Puerto Rican, Dominican, West Indian, and South Asian populations. Due to gentrification of other Brooklyn neighborhoods, closer to Downtown Brooklyn and Manhattan, such as Bushwick and Bed-Stuy, East New York now has one of the fastest growing Black, Latino, and Asian populations in the city. East New York consists of mixed properties but primarily semi-detached homes, two-to-four family houses, and multi-unit apartment buildings, including condominiums and co-ops. The total land area is one square mile. The area is also home to the East Brooklyn Industrial Park. The 44-block Park was established in 1980 by the New York City Public Development Corporation in East New York's northwest quadrant. It is bounded by Atlantic Avenue, Sheffield Avenue, Sutter Avenue and Powell Street. Public housing developments of various type and a smaller number of tenements populate the area. There are twelve New York City Housing Authority developments located in East New York. Boulevard Houses was the first of 12 developments to be built in the area. Built in 1950, it includes eighteen buildings, 6 and 14 stories tall. Linden Houses; nineteen buildings, 8 and 14 stories. Pennsylvania Avenue-Wortman Avenue; three buildings, 8 and 16 stories tall. Unity Plaza (Sites 17, 24, 25A); three buildings 6 stories tall. With the founding of East New York Farms in 1998, there has been an increase usage in lots. Various organizations and local community groups have different gardens in order to beautify the area. African Burial Ground Square was designated in 2013 after remains were found some years earlier between New Lots and Livonia Avenues from Barbey to Schenck Streets. It shares space with the New Lots branch of the Brooklyn Public Library. After months of effort the burial ground was finally confirmed and formally recognized. City Line is a sub-section of East New York bordering the neighborhoods of Cypress Hills to the north and southwest and Ozone Park (Queens) to the east. The neighborhood is named "City Line" for its location in the former City of Brooklyn near the border with Queens County before Brooklyn and parts of Queens County were consolidated into New York City in 1898. City Line is one of the most ethnically diverse neighborhoods in Brooklyn. [original research?] Many Italians, Germans and Irish originally lived in the area, which today is home to immigrants from Bangladesh, the Dominican Republic, Guyana, and Puerto Rico. The neighborhood also includes African-Americans and Latino-Americans, and a scattered presence of South Asian-Americans. The main commercial district is located along Liberty Avenue. The neighborhood is served by Brooklyn Community Board 5. City Line is home to many restaurants, shopping stores, and food markets. New Lots is a sub-section of East New York. The "New Lots" east of the Town of Flatbush were laid out in the 18th century and were considered to be an eastward extension of Flatbush. The area was the site of the Town Hall of New Lots (located at 109-111 Bradford Street) from 1852 when the area seceded from Flatbush until it was annexed in 1886 as the 26th Ward of Brooklyn. The population is largely African-American and Latino-American. The neighborhood is part of Brooklyn Community Board 5. IS 218, PS 72 and Invictus Preparatory Charter School are right across from the public houses. Nearby neighborhoods include Canarsie to the south, Brownsville to the west and City Line to the east. Spring Creek is the southeastern part of the former Town of New Lots, and is often included in East New York. Its boundaries moving clockwise are: Linden Boulevard to the north; Betts Creek and Fountain Avenue to the east; Gateway National Recreation Area to the south; and Schenck Avenue and Hendrix Creek to the west. Some locations north of this area up to Linden Boulevard are also considered part of the neighborhood. Spring Creek includes the Starrett City apartment complex, the Gateway Mall, the Spring Creek Gardens gated housing development, and the Nehemiah Spring Creek and Gateway Elton affordable housing developments. For other uses, see Cypress Hills (disambiguation). This neighborhood is demographically mixed: Latino-Americans, South Asian-Americans, Caribbean Americans, Caucasians and African Americans. The neighborhood's population as of 2011[update] is 17,089. The area of Cypress Hills is 0.276 square miles (0.71 km2). Franklin K. Lane High School was at the extreme northeast corner of the neighborhood, north of Jamaica Avenue; it closed in 2011. P.S. 108 Sal Abbracciamento School is at 200 Linwood Street (on the corner of Arlington). It is a public elementary school with an enrollment of about 900 students in grades pre-K through 5. Its building dates to 1895 and is listed on the National Register of Historic Places. Blessed Sacrament Elementary School is on Euclid Avenue, between Fulton Street and Ridgewood Avenue. IS 171 is on Ridgewood Avenue between Nichols Avenue and Lincoln Avenue. IS 302 is also a public school, on Linwood Street between Atlantic Avenue and Liberty Avenue. Within IS 302, due to lack of funding, there used to be a public school ranging from grades K (kindergarten) to 8th grade, P.S. 89 (aka Cypress Hills Community School) which has since attained its own school building not far from IS 302 on the corner of Atlantic Avenue and Warwick Street. PS 7 sits between Crescent Street and Hemlock Street. PS 65 "The Little Red School House" serves 549 students in grades K–5. PS 290 sits on the corner of Fulton St. and Schenck Ave. Followers of Jesus School is a private Christian school that sits on Atlantic Ave, between Shepherd Ave and Essex Street. Starrett City (also Spring Creek Towers) is a large subsidized apartment complex. Its boundaries, starting from the north and moving clockwise are: Flatlands Avenue to the north, Hendrix Street to the east, Jamaica Bay to the south and the Fresh Creek Basin. The Starrett City site spanned over 153 acres (0.62 km2) before being subdivided in 2009 as part of a refinancing. The housing development contains 5,881 apartment units in 46 buildings, and is said to be the largest federally assisted rental property in the United States. The residential site also includes eight parking garages, a community center, and a number of parcels of undeveloped land were separated out from the residential site as part of the refinancing. The residential portion of the property has eight "sections" each including several buildings, its own field, recreational area (jungle gym, park, handball court, basketball court) and a parking garage for residents in that section. These sections are Ardsley, Bethel, Croton, Delmar, Elmira, Freeport, Geneva, and Hornell; each named after municipalities in New York State. Each building has between 11 and 20 floors, with eight apartments on most floors. All of the apartment buildings have a street address as well as a building name consisting of one letter from A-H, and one number from 1-8. In this case, A5 would refer to the fifth building of Ardsley Loop. With its many grassy fields, Fresh Creek, and Spring Creek Towers Shopping Center, Starrett City is different in landscape, community, and neighborhood life than other regions of Brooklyn. The community has its own newspaper known as the Spring Creek Sun. The Hole is an isolated section that is also a part of Queens. A run-down neighborhood considered "lost", it has the lowest elevation within the city and is considered to be like the Wild West in some fashions. It is generally bordered by Ruby Street, South Conduit Avenue, and Linden Boulevard. The area is home to the Federation of Black Cowboys. North of East New York is Highland Park, the Queens borough line, Ridgewood, Glendale and numerous cemeteries. Bushwick and Bedford–Stuyvesant are northwest of East New York. Brownsville is west of East New York. Canarsie is southwest of East New York. South of East New York is Jamaica Bay. 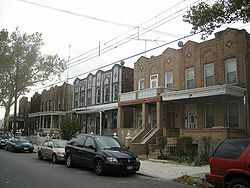 Woodhaven, Ozone Park, and Howard Beach are Queens neighborhoods east of East New York. The 75th Precinct has a lower crime rate than in the 1990s, with crimes across all categories having decreased by 73.1% between 1990 and 2018. The precinct saw 7 murders, 70 rapes, 603 robberies, 940 felony assaults, 441 burglaries, 1,030 grand larcenies, and 207 grand larcenies auto in 2018. The majority of East New York is covered by ZIP Codes 11207 and 11208, though Starrett City is covered by its own zip code, 11239. The United States Post Office operates the East New York Station at 2645 Atlantic Avenue and the Spring Creek Station at 1310 Pennsylvania Avenue. East New York generally has a lower ratio of college-educated residents than the rest of the city. While 21% of residents age 25 and older have a college education or higher, 23% have less than a high school education and 56% are high school graduates or have some college education. By contrast, 40% of Brooklynites and 38% of city residents have a college education or higher. :6 The percentage of East New York students excelling in reading and math has been increasing, with reading achievement rising from 26 percent in 2000 to 32 percent in 2011, and math achievement rising from 19 percent to 43 percent within the same time period. The New York City Department of Education operates public schools in the area. East New York high schools suffer from high dropout rates. As with other NYC schools, gang violence is a common problem found in the local schools. East New York has two higher institutes such as Touro College and Be'er Hagolah Institute in Starrett City. Spring Creek High School open in 2012 becoming the fifth high school in 60 years and the first in the Spring Creek area. One of the neighborhood's local public high schools, Thomas Jefferson High School, shut down in June 2007 due to extremely low academic performance: a graduation rate of 29%, with only 2% entering the school at grade level in math and 10% entering at grade level in reading. The school was known for its ROTC program. Four new high schools were organized in the old building. The Arlington branch at 203 Arlington Avenue near Warwick Street, a Carnegie library. The Cypress Hills branch at 1197 Sutter Avenue near Crystal Street. It was founded in 1955 and the current building opened in 1995. The New Lots branch and New Lots Learning Center at 665 New Lots Avenue near Barbey Street. It was founded in 1942 and became a BPL branch in 1949. The Spring Creek branch at 12143 Flatlands Avenue near New Jersey Avenue, which opened in 1977. The 2, ​3, ​4, and ​5 trains at Pennsylvania Avenue, Van Siclen Avenue and New Lots Avenue on the IRT New Lots Line. This line serves New Lots, and is closest to Spring Creek. The L train at Broadway Junction , Atlantic Avenue, and Sutter Avenue. This line serves western East New York, then goes down to Brownsville and Canarsie, and it is closest to Starrett City. The A and ​C trains at Broadway Junction, Liberty Avenue, Van Siclen Avenue, Shepherd Avenue, Euclid Avenue, and Grant Avenue on the IND Fulton Street Line. This line serves City Line and New Lots. The J and ​Z trains at Broadway Junction, Alabama Avenue, Van Siclen Avenue, Cleveland Street, Norwood Avenue, Crescent Street, and Cypress Hills on the BMT Jamaica Line (all stations except Broadway Junction, Alabama Avenue, and Crescent Street are served by J and ​Z trains in a skip-stop fashion during rush hours). This line serves Cypress Hills and northern East New York. In addition, the neighborhood contains the East New York station on the Long Island Rail Road's Atlantic Branch. The New York City Subway's East New York Yard, Livonia Yard, and Pitkin Yard, as well as New York City Bus's East New York Bus Depot and Spring Creek Bus Depot, are all in the neighborhood, but none of these are open to the public. The freight-only Bay Ridge Branch demarcates the western border of East New York. Martin Goldstein (c. 1905–1941), member of a gang of hitmen, known as Murder, Inc.
^ a b "NYPD – 75th Precinct". www.nyc.gov. New York City Police Department. Retrieved October 3, 2016. ^ "Spring Creek Park: History". New York City Parks Department. Retrieved November 18, 2015. ^ Natural Resources Group. "Natural Area Mapping and Inventory of Spring Creek 1988 Survey" (PDF). New York City Parks Department. Retrieved November 18, 2015. ^ a b John Homer French (1860). Gazetteer of the State of New York: Embracing a Comprehensive View of the Geography, Geology, and General History of the State, and a Complete History and Description of Every County, City, Town, Village and Locality: With Full Table of Statistics. R. Pearsall Smith. p. 372. ^ a b c d e "Broadway Junction Transportation Study: NYC Department of City Planning Final Report-November 2008" (PDF). nyc.gov. New York City Department of City Planning. November 2008. Archived from the original (PDF) on June 6, 2010. Retrieved October 27, 2015. ^ a b c d Kenneth T. Jackson; Lisa Keller; Nancy Flood (December 1, 2010). The Encyclopedia of New York City: Second Edition. Yale University Press. p. 5716. ISBN 978-0-300-18257-6. ^ "THE BROOKLYN & JAMAICA RAIL ROAD THE LONG ISLAND RAIL ROAD and ATLANTIC AVENUE PART ONE". ARRT'S ARRCHIVES. ^ "Early History of the LIRR". ^ "All Books". The New Press. Retrieved May 28, 2015. ^ "73rd Precinct CompStat Report" (PDF). Retrieved January 24, 2011. ^ "NYC Dropout Rates". Gothamgazette.com. March 20, 2006. Retrieved January 24, 2011. ^ Thabit, Walter (2003). How East New York Became a Ghetto. New York: NYU Press. ISBN 0-814-78266-3. ^ a b c Roberts, Sam (September 24, 1987). "Metro Matters; Despite Success, Housing Effort Still Struggling". The New York Times. ISSN 0362-4331. Retrieved January 18, 2017. ^ a b Schwartz, Ethan (August 18, 1985). "CHURCH GROUP WINS CITY'S HELP IN BROOKLYN HOUSING DRIVE". The New York Times. ISSN 0362-4331. Retrieved January 18, 2017. ^ a b Sundays, Sydney H. Schanberg ; Flora Lewis's Column Now Appears On; Thursdays (February 21, 1984). "NEW YORK; BRICKS AND LOCAL POWER". The New York Times. ISSN 0362-4331. Retrieved January 18, 2017. ^ Siwolop, Sana (May 16, 2001). "A Mall Planned for East New York Is 88% Leased". The New York Times. Retrieved August 27, 2010. ^ a b c d e f g h i j k l m n o "East New York and Starrett City (Including Broadway Junction, City Line, Cypress Hills, East New York, New Lots, Spring Creek and Starrett City)" (PDF). nyc.gov. NYC Health. 2018. Retrieved March 2, 2019. ^ "NYC-Brooklyn Community District 5--East New York & Starrett City PUMA, NY". Retrieved July 17, 2018. ^ "NYCHA Redirect". nyc.gov. Archived from the original on May 25, 2015. Retrieved May 28, 2015. ^ "The Seeds They Carried". The New York Times. October 18, 2012. Retrieved April 25, 2016. ^ "Citywide African Burial Grounds Gain Recognition," Our Time Press, October 31 – November 6, 2013, p.10. ^ "East New York African Burial Ground officially recognized". amsterdamnews.com. Retrieved January 20, 2016. ^ Liff, Bob (April 27, 1999). "Where City Drew the Line Double Lives the Norm in Border Nabe". Daily News. New York. Archived from the original on November 24, 2010. Retrieved August 22, 2009. ^ Hays, Elizabeth (March 9, 2003). "Thriving City Line Draws Hard Workers". Daily News. New York. Retrieved August 22, 2009. ^ "New York City". 124.2. Retrieved May 28, 2015. ^ "Asian American Federation: Census Information Center". aafny.org. Retrieved May 28, 2015. ^ "Preservation advocates call for landmarking in East New York's rezoning area - Brooklyn Daily Eagle". www.brooklyneagle.com. Retrieved December 29, 2017. ^ a b "COMMUNITY PORTAL: BROOKLYN Community District 5". nyc.gov. New York City Department of City Planning. Retrieved November 18, 2015. ^ Sheftell, Jason (July 27, 2012). "Spring Creek Nehemiah is an affordable housing success story in East New York". Daily News. New York. Retrieved November 14, 2013. ^ "If You're Thinking of Living In/Cypress Hills - An Evolving Northeast Brooklyn Enclave - NYTimes.com". April 28, 1996. Retrieved April 25, 2016. ^ Beyer, Gregory (December 2, 2010). "Where Prices Are Practical, and Cuisines Colorful - Living in Cypress Hills, Brooklyn". The New York Times. ISSN 0362-4331. Retrieved February 18, 2016. ^ "NYC Data: it's all here!". Baruch College. Retrieved January 17, 2019. ^ "Cypress Hill neighborhood in Brooklyn, New York (NY), 11208 subdivision profile - real estate, apartments, condos, homes, community, population, jobs, income, streets". city-data.com. Retrieved May 28, 2015. ^ "Analysis: NYC 2000 to 2010 demographic change". Archived from the original on October 13, 2015. Retrieved April 25, 2016. ^ "Cypress Hills neighborhood in New York". Retrieved June 4, 2014. ^ "Injury Blogs". schoolmatters.com. Retrieved May 28, 2015. ^ "Welcome - P.S. 108 Sal Abbracciamento - K108". New York City Dept. of Education. ^ Bagli, Charles V. (August 3, 2007). "With Starrett City Deal Nearly Dead, Developer Tries Again". The New York Times. Retrieved September 2, 2010. ^ "Safe Zone by Tucker Carlson, City Journal Summer 1995". city-journal.org. Retrieved May 28, 2015. ^ Dorr, Nate. "In the Hole". Impose Magazine. Retrieved September 26, 2012. ^ Asch, Mark (October 27, 2010). "Brooklyn's Lost Neighborhood: The Hole". The L Magazine. Retrieved September 26, 2012. ^ Janon Fisher (October 17, 2004). "Echoes of the Wild West Mark an Urban Frontier". New York Times. Retrieved September 26, 2012. ^ Kilgannon, Corey (October 10, 2006). "Black Cowboys Ride the Range in Queens, and Keep a Sharp Lookout for Traffic". New York Times. Retrieved September 26, 2012. ^ Waddell, Robert (August 6, 1995). "THE FRESH AIR FUND; Black Cowboys Share Their Art With Urban Children". New York Times. Retrieved September 26, 2012. ^ "East New York and Cypress Hills – DNAinfo.com Crime and Safety Report". www.dnainfo.com. Retrieved October 6, 2016. ^ "75th Precinct CompStat Report" (PDF). www.nyc.gov. New York City Police Department. Retrieved July 22, 2018. ^ "Engine Company 332/Ladder Company 175". FDNYtrucks.com. Retrieved March 2, 2019. ^ "Engine Company 290/Ladder Company 103". FDNYtrucks.com. Retrieved March 2, 2019. ^ "Engine Company 236". FDNYtrucks.com. Retrieved March 2, 2019. ^ "Engine Company 225/Ladder Company 107/Battalion 39". FDNYtrucks.com. Retrieved March 2, 2019. ^ "NYC Neighborhood ZIP Code Definitions". New York State Department of Health. November 7, 2014. Retrieved March 5, 2019. ^ "East New York/Starrett City – BK 05" (PDF). Furman Center for Real Estate and Urban Policy. 2011. Retrieved October 5, 2016. ^ "Arlington Library". Brooklyn Public Library. August 23, 2010. Retrieved February 21, 2019. ^ "Cypress Hills Library". Brooklyn Public Library. August 19, 2011. Retrieved February 21, 2019. ^ "New Lots Library". Brooklyn Public Library. August 22, 2011. Retrieved February 21, 2019. ^ "Spring Creek Library". Brooklyn Public Library. August 22, 2011. Retrieved February 21, 2019. ^ "Rapper AZ Returns To Brooklyn For New BET Web Series". Bossip. March 9, 2016. Retrieved April 20, 2019.